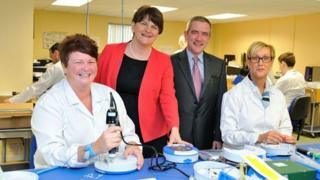 A Belfast-based company that makes heart defibrillators is to create 40 new jobs. HeartSine Technologies is the only manufacturer of defibrillators in the UK and Ireland. Its machines are sold in more than 70 countries across the world. Enterprise Minister Arlene Foster said the jobs would contribute about £1.3m a year in salaries to the economy. The jobs are being supported by a grant of £360,000 from Invest NI. "Life Sciences is one of Northern Ireland's fastest developing business sectors and it is encouraging to see companies such as HeartSine investing in growing its operations here," she said. The company's chief executive, Declan O'Mahoney, said: "Our objective is to strengthen our workforce in Belfast so that we can double sales of our existing product portfolio in our target markets over the next three years. A defibrillator can be used by anyone to deliver an electric shock to the chest to restore a person's heart to a normal rhythm after a cardiac arrest.